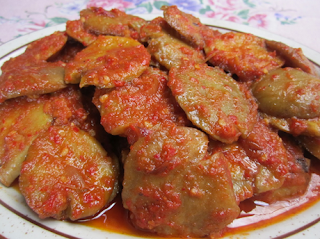 - The first step, Iris widened with a thick meat approximately 1 cm, then cut into pieces according to taste. - Then mix the meat with spices, ground red peppers, tomatoes, tamarind and ginger kandis previously been crushed. Mix until evenly, then let sit for approximately 30 minutes and then store in the refrigerator so that the marinade is absorbed. - Furthermore, heat the oil then enter berbumbu..kemudian meat stir until meat looks discolored. 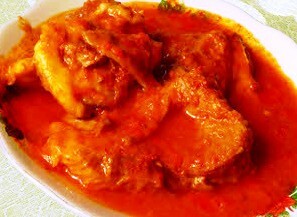 - After that add water, stir, and cook until the meat becomes tender and sauce thickens visible. 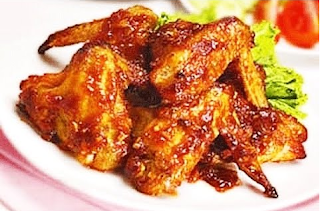 - Lastly, Season sugar to taste (1 tsp), then stir until evenly mixed, then lift and artificial spicy sour meat you are ready to serve. - The first step, cut the chicken from the center of the chest towards the neck. and turn the tap back to the chicken body open, then set aside. - The second step, stir-fry seasoning ingredients (except lime and sugar) until fragrant, then add brown sugar, mix well and remove from heat. After that give the lemon juice, then stir again until blended. - Next, coat the chicken with the spice until blended. Then prick-prick with a fork chicken body. - Then let stand for about 1 hour to allow the flavors to infuse. Boil jengkol currently peeled with a covered vessel until tender , about 2 hours . If the water runs out of his ari add more . If it is soft , remove from heat , let coolinging and then make flat all jengkol , set aside. Heat oil , saute ground spices , ginger , ememembaymentmentment departs and lime departs until fragrant delay while occasionally rousing . Put jengkol , mix well , then pour a little water mix afresh until evenly prepared food . Add enhanced condensed soy dressing , saline and type of flavor, mix evenly . delay until the water dries-out-out up and the spices to infuse into the beef jengkol , lift . Jengkol Serve with a plate of moderately hot white rice .